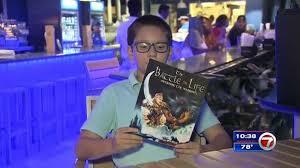 SUNNY ISLES BEACH, FLA. (WSVN) - An 11-year-old boy has written a book after overcoming his own personal battle with cancer. Lucas Ryan was diagnosed with cancer when he was only 8 years old. “High risk T-cell lymphoma, and I have been in remission for almost a year and a half,” Ryan said. Ryan held a book signing at the Beach Bar at Newport Pier in Sunny Isles Beach, Thursday night, where his friends, family and fans gathered to celebrate the book. “Extremely proud, of course, but I was mostly shocked because you just don’t expect such a young kid to accomplish this, not at his age,” said Gratziela Lazarov, Ryan’s mother. Ryan’s own struggle inspired him to create the Lucas Ryan Foundation. “And all of the money and all of the proceeds will go to families who can’t afford food, gas, can’t pay their bills,” Ryan said. “All the sales go to the Lucas Ryan Foundation, and it benefits pediatric cancer and kids that are battling cancer and their families, whatever they need,” Lazarov said. Even though the worst of it has passed, Ryan said he will never forget what he learned from the cancer. “I think if I ever had 10 percent of his strength, I’m gonna thank God for that because I don’t now if I can have the strength that he did,” said Joe Zebrowski, the owner of bar. Ryan said “The Battle for Life” is about a boy who fights an evil dragon. If you are interested in buying the book or making a donation, go to http://lucasryanfoundation.org. Copyright 2017 Sunbeam Television Corp. All rights reserved.